This review was originally written for ABCRIT, and appeared there in October 2017. John Hoyland Stain Paintings 1964-1966 is the first in-depth exhibition of the painter’s work in the United States in 25 years. Hoyland’s work is rarely seen on this side of the Atlantic and this marks only the third time I have been able to see works by the artist “in the flesh”. The first being at Flowers Gallery (NY) in the group exhibition The Independent Eye: Contemporary British Art from the Collection of Samuel and Gabrielle Lurie which featured a small number of works by Hoyland dating from the early 1980s through the early 2000s. The second was the stunning Power Stations mini retrospective in 2015 at Damien Hirst’s Newport Street Gallery in London. In 1964, at the age of thirty, John Hoyland (1934-2011) was awarded a traveling fellowship by the Peter Stuyvesant Foundation and with it traveled to New York for the first time. There he either met or renewed acquaintances with prominent members of the New York School including Barnett Newman and Helen Frankenthaler as well as the formidable critic Clement Greenberg, and several of the painters he championed as post painterly abstractionists- Kenneth Noland, Paul Feeley and Jules Olitski. These latter three artists had a considerable affect on the works on view here. The Abstract Expressionists certainly influenced the scale of works being made in Britain with the arrival, at the Tate, of The New American Painting show in 1959. But by 1964 surely artists were becoming accustomed to seeing and making large scale work. After all by that year Bridget Riley had completed Continuum (1963), a 3-D installation/structure that measured 8.53 m long, 2.1 m high and 3.65 m in diameter. And Patrick Heron, Brett Whiteley, Michael Andrews, Gillian Ayres and Hoyland himself, among many others, were routinely making works in the 203 x 203 cm range. 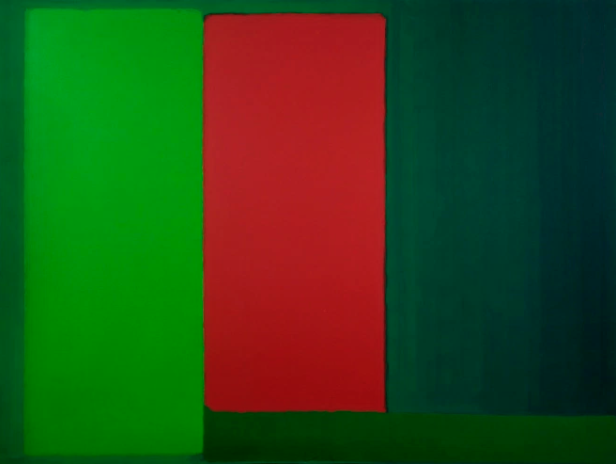 However, the post painterly group heralded by Greenberg shifted Hoyland’s perspective in a couple of ways. The first was the Greenbergian idea of reduction, both in form and in abolishing the evidence of the artist’s hand. This allowed the focus to become the materials as well as the self- evident nature of the object they formed. In London, Hoyland had already come in contact with a healthy dose of formalist coolness, objecthood and non-referential color having developed friendships and artistic dialogues with sculptors like Anthony Caro and William Tucker. The second shift was caused by the paint itself. The work that Hoyland encountered in New York was painted using Magna (first used by Noland to stain cotton canvas in his centered compositions of the 1950s) and various water soluble acrylics and gels that made intensity of color, transparencies and gradations easier to achieve in large scale work when applied with sponges and rollers as Noland did and as Hoyland later emulated. In Hoyland, these new attitudes, energies and exciting material developments combined with an acute and serious sense of feeling for what paint was capable of and an admiration for the solemnity evidenced by the older painters, Mark Rothko and Barnett Newman, to produce the piercing color, painterly happenstance and a studied reason we find in the seven monumental stain paintings on view here. John Hoyland, “16.8.66”, 1966, acrylic on canvas, 213.4 cm x 304.8 cm. In 16.8.66 the viewer first notices the vivid red expanse that covers most of the picture plane from the top down. This intense wash is uneven. Perhaps bits of underpainting show through the inconsistent ground helping it to pulsate and to sharply interact with the centered green bar. To the left and right of this focal point, a yellow-orange bar and a tart, yellow-green bar are forced against the edges of the canvas. Their placement takes on a double duty, providing both stability and tension. These stakes anchor the composition and jangle all at once with uneven and shimmering edges that vibrate against the red slivers of paint that barely confine them in their plane. The three bars hover slightly along the bottom border of the canvas connected by a darker forest green rectangle on the left floor and a muddied red-violet wedge on the bottom right side. These connectors also destabilize - particularly as the light green bar on the right balances precariously on the wedge’s thinner point. The colors and their opacity or lack of it are of tremendous importance here. The red-violet, dark green and yellow-orange are a calming tertiary triad while the hot red interacts with the lighter greens causing a jolt. Nothing in this work is sure. Just when the red envelops the smaller forms- seeping into their nooks and suspending them like insects in amber, the next glance sees that they are violently rejected. And they never seem to fit quite as securely into their niches when they are drawn back in. 7.11.66 offers us a more comforting depiction of three-dimensional space and traditional perspective but even here assumptions prove groundless. 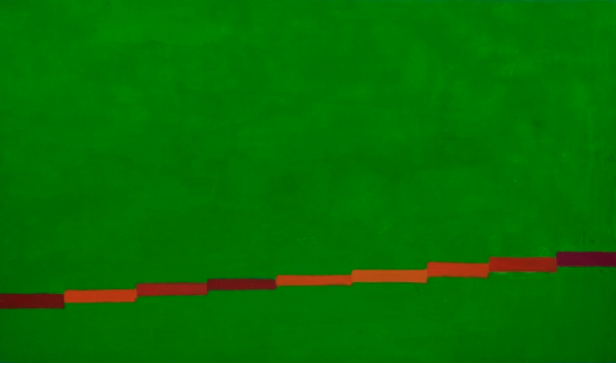 This large canvas is divided into equal parts- what can be seen as a cobalt floor, rolled over dark green, supporting a rusty wall form on the left side and a solid grass green base holding up an inverted orange wedge, with a red wash drug over its surface leaving a residual ghost trail along the top, to the right. These forms/scenes sit like a zipper’s teeth between clamping rectangles of a hastily applied green wash that interacts and alters every edge it touches. Our three-dimensional touchstones are flattened, turning natural cubed spaces into mitered, jointed wedges shoved against the painting’s surface. The smallest work included in the show seems like a cut away remnant compared to the other monumental and intricately arranged compositions. I have read that Hoyland was familiar with Pollock’s tendency to paint on large pieces of canvas and crop out the best parts for final compositions, but that he mostly eschewed this tactic in favor of Barnett Newman’s cropping is photography dictum. In any event, Untitled, c. 1965 (61.43 x 182 cm) is definitely the odd one out in this group. The composition is simple and has no visual intricacy. Hoyland assigns its forms, more than any other piece in the show, to familiar figure ground roles. Five thin lozenge forms jut down from the long top edge, warm reds, oranges and combinations of the two colors, are set against an evenly stained lime green background. 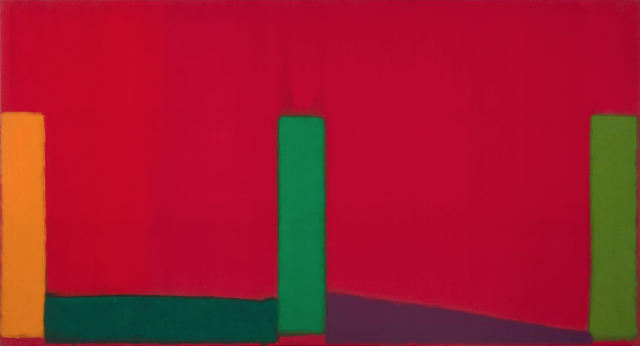 John Hoyland, “11.10.64”, 1966, acrylic on canvas, 198.1 cm x 335.3 cm. Even 11.10.64, a large, uncomplicated work completed the previous year, provides depth and visual interest by juxtaposing the opposites: thick/thin, fast/slow, light/dark and by staggering the small bars that run along the bottom of the piece at a slight incline. The way Hoyland is able to hold the viewer’s interest in this larger piece seems to confirm that Untitled as an experimental after thought. 7.65 (304.8 x 214.63 cm) fits neatly onto its allotted wall at the end of a more narrow and rectangular space in the gallery, making it seem like a destination as the viewer approaches. A tight grouping of thin and thick rectangles in solid contrasting colors join to form an L shape down the left side and skim along the canvas’ bottom edge to stop abruptly an inch from the lower right border. Drips and spatters from the lower segments of color cement the relationship to the lower edge and restate its importance to the composition. Several of the trapezoidal links in the bordering frame allude to a linear perspective that leads either to infinity or hits a wall depending on the opacity or transparency of the thinly applied, high key green ground. This is another formidable but simple composition given subtle spark and complexity by adroit, painterly variations. John Hoyland’s reputation as a painter’s painter and manipulator of abstracted space was made with these works and the thoughtful, cunning and intuitive way that he applied paint and composed forms. The painter’s love of his materials and tools of the trade and his respect for, and belief in, what non objective painting can impart are very much present and felt in these early works of great ambition and restraint.